We are v ery excited to announce that The Lads are back! This group of current and former teachers, principals and administrative leaders will have you moving all night long to their deep set list and danceable classics. They are Barry Bickerton, Jean-Francois Fauteux, Peter Gamwell, Richard King, Dave Petrie and Neil Yorke-Slader. 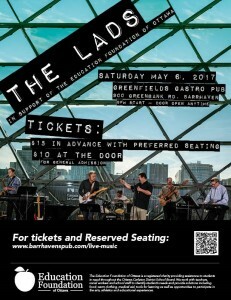 ​Join The ‘Lads’ for a night of high energy, rocking music and dance the night away to help the Education Foundation of Ottawa support disadvantaged students in Ottawa. See some of the finest musicians the Ottawa-Carleton District School Board has to offer in support of a fantastic charity. Proceeds will support the Student in Crisis Fund at the Education Foundation of Ottawa. Get your tickets early – t​his is sure to sell out!! !